Pour over coffee makers are the “Western” version of the cafetiere, or French press. Instead of brewing coffee in the enclosed glass carafe, the pour-over coffee maker is like a small version of a regular drip coffee machine. You have a carafe that holds the water, as well as a plastic filter holder that you place on top your cup. Fill the filter with coffee ground, pour the hot water into the filter, and let the coffee drip slowly down until your cup is filled. It’s simple, practical, and–best of all–cheap! As long as you have a good water heating system, you can make coffee in a matter of minutes with little to no energy use. 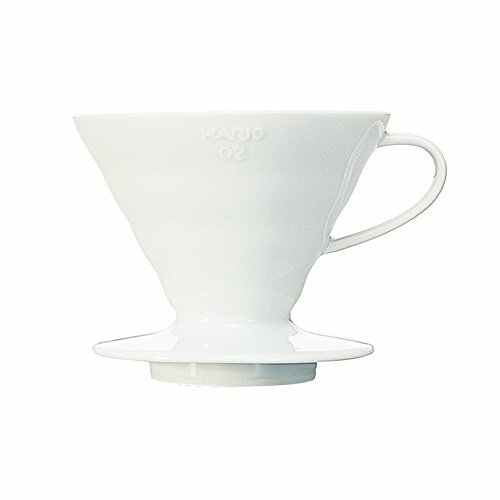 This beautiful little pour-over coffee maker is our #1 pick — not only because it’s beautifully inexpensive (just $6! ), but it’s one of the most practical to use. 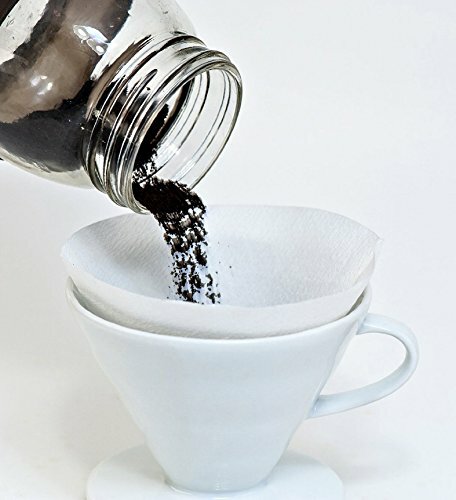 It’s as simple and easy as any pour-over coffee maker: add a filter, fill with coffee grounds, pour in the water, and let it drip into your cup. It can be used atop just about any mug, travel cup, or coffee carafe, delivering a rich, delicious brew in a matter of minutes. Once your coffee is made, you can pop it into the dishwasher to ensure it’s as clean as possible. It’s lightweight, compact, durable, and makes a surprisingly tasty cup of coffee.hine You’ll need to have paper filters on hand, but considering how little you’ll pay for the coffee maker itself, it’s definitely a budget-friendly buy. For $20, this is one of the best purchases on our list! 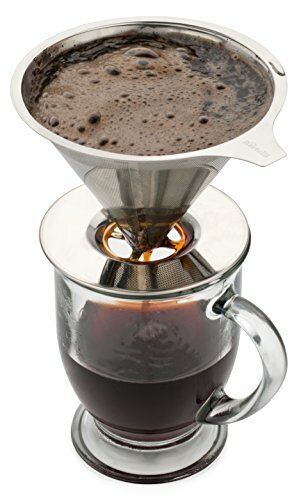 It may be slightly pricier than some of the other pour over coffee makers on this list, but it has one unique feature: a built-in filter. 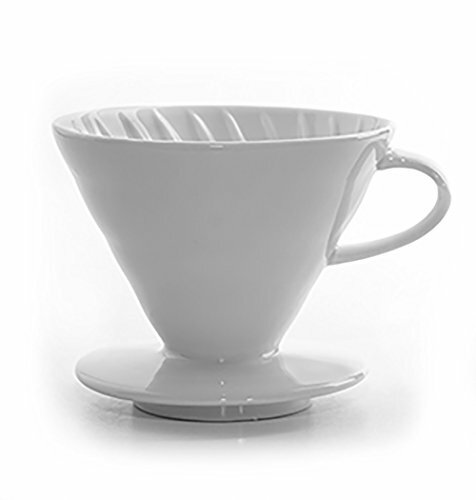 You never need to use a paper filter again, as the pour over coffee maker has its own integrated filter. The metallic filter will encourage the natural essential oils and flavonoids of the coffee to drip into your cup, rather than being soaked into the paper filter. There is far less waste with this design, and you’ll find that you get a much stronger, more concentrated brew every time. But don’t think you’re going to end up with a cup full of coffee ground! The filter is laser-cut, and the holes are so small that not even the most finely-ground coffee will slip through. It’s the perfect option for those who want to make coffee the right way, according to their preferences (coarser or fine ground). Best of all, the filter is 100% dishwasher safe, easy to wash, and surprisingly durable. Ceramic and glass break and plastic is easily scratched, but metal is able to stand up to a lot of wear and tear. 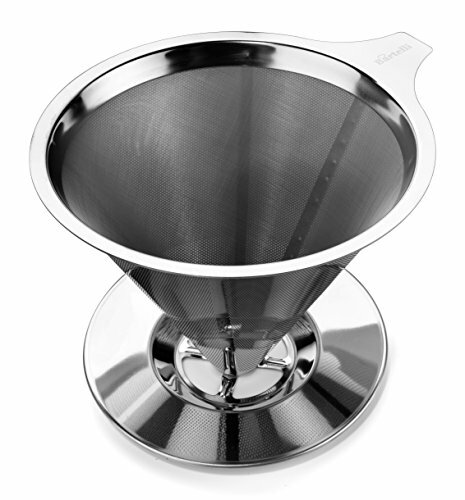 It’s the perfect pour over coffee maker for those who make a lot of coffee at home. A VERY good investment! This is one of those pour over coffee makers you have to have to impress guests! The beautiful, sparkling white ceramic will pair perfectly with any china or ceramic tea and coffee sets, and the base of the coffee maker will fit most cups. It’s a versatile coffee maker that produces a quality cup of coffee in just a few minutes. The fact that it’s ceramic means that it will be cleaner and more sterile than a plastic pour over coffee maker. You’ll get crisp, fresh flavors with every cup of coffee, and you won’t have to worry about residue build-up (a common problem with plastic). The ceramic also keeps the coffee nice and hot with every brew! What makes this coffee maker unique is the over-sized hole in the base. It allows you to brew the coffee at your own speed–slower for more concentrated flavor, faster to conserve grinds or fill a larger pot more quickly. Be warned: ceramic is more likely to chip and crack than plastic. You’ll need to be careful when washing this coffee maker, especially in the dishwasher. It’s better to wash by hand, but avoid using soap! A rinse with warm water is all you need to keep the coffee maker clean. Best of all, it costs you just $11! Talk about a great product at a great price. This over-sized coffee maker is ideal for entertaining, as it will produce 4 or 5 normal-sized mugs of coffee. You’ll impress your guests with your unique coffee brewing set-up, and they’ll be able to watch their coffee percolate as they relax. The glass carafe is able to hold up to 8 cups (5 ounces each) of coffee, but the coffee maker can be purchased in sizes ranging from 3 to 10 cups. The glass is durable and break-resistant, but you will still need to be careful with how you handle it. One fall, and it WILL shatter. The beauty of this carafe is that it’s 100% glass. Glass is stain-resistant, meaning it will be easy to keep clean and won’t soak up the flavors of previous brews. Rinse it with a bit of warm water (no soap needed), and you’ll find that the glass carafe stays clean and fresh with every use. With no “moving parts”, it’s a user-friendly carafe indeed. 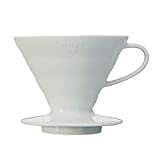 On the downsides, it is ONLY compatible with Chemex filters, however, so you won’t be able to use them with regular coffee filters. You’ll also spend upwards of $40 on this carafe–you’re paying more for the appearance than for quality. It’s a beautiful, well-designed glass carafe with a wooden collar, and it will enhance your living room or dining room décor. This ceramic coffee maker is made with Japanese quality, and you’ll find that it’s one of the best for a fully customizable brew. The large hole at the base of the coffee dripper allows you to make the coffee as fast or slow as you want, giving you a larger quantity or more concentrated flavors as desired. Instead of the classic “ribbed” patterns, this great coffee maker has a swirling pattern inside that helps to control the flow of the water and enhances the brewing process. Such a small change, but it can make all the difference in the flavor of your coffee! The fact that it’s ceramic means that it helps to maintain the temperature of your coffee. 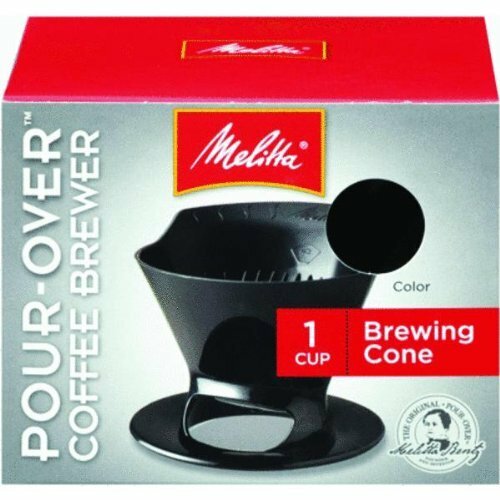 It will brew anywhere from 1 to 3 cups of coffee at a time, and is compatible with most #2 coffee paper filters. The ceramic is durable and chip-resistant, and can be washed in the dishwasher. However, you’ll find that a bit of warm water and a clean sponge will be more than enough to keep the ceramic pour over coffee maker clean after each use. Previous Post: « Battle of the Coffee Pod Machines: Who Comes Out on Top?